I’m in love. With a car. Daft as it sounds, if you read on you might start falling for the Jaguar XF as well. I can’t remember feeling so good in a car. Except, maybe, during a brief fling with an XKR convertible. The XF I’ve been driving isn’t one with the slightly suspect 2.7 V6 diesel engine. 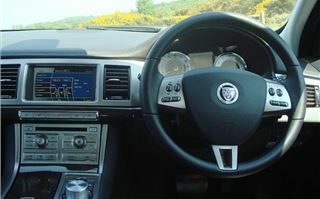 Or with the old Mondeo’s 3.0 litre V6, not bad that this engine is. 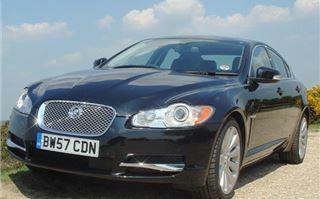 I’ve been tooling around in the all-Jaguar 300bhp XF 4.2 V8. And unless you stump up an extra £10k for a supercharger, that’s the quickest one they make. It was black. A good colour for it because it accentuates its length. At 16’ 3” it stuck out from my hard-standing as much as a Mercedes CLS had a few years ago. And it looked so long and sleek I couldn’t wait to get comfortable inside. That’s when it plays a couple of unnecessary but effective tricks. It’s keyless, so you just walk up to the car with a gizmo in your pocket, get in, press the brake pedal with a foot, and press the starter button with a finger. It doesn’t start, it whoops into life with a promise of pleasures to come, while the airvents open, like eyes waking up, the satnav screen lights up and a knob rises out of the console. To get going you just turn the knob from P to D (or R in my case), let your foot off the brake, and you’re moving. It works astonishingly well and you wonder why carmakers persisted with gearsticks for automatics for so long. Behind the leather steering wheel are a pair of paddles to allow you to take control. And, just like the XK, there’s a linear display right in front of your eyes telling you what gear you’re in. Taking the delivery driver to the station I just let it do its own thing. Give it some beans and it shrinks around you. The light steering becomes more positive. The paddleshifts are as quick as the XK’s (as you’d expect). Introduce it to a serious corner and it just goes round, with a touch of oversteer if you want. 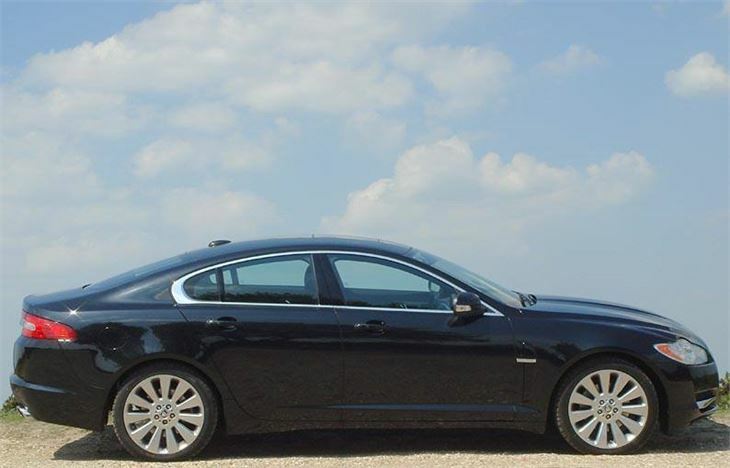 It handles more assuredly and predictably than a Mercedes CLS, its natural enemy. Show it a straight and it goes like a bat out of hell. Okay, obviously not like an RS6 V10 twin-turbo with nearly twice the power. But it’s plenty quick enough. And exceptionally agile. 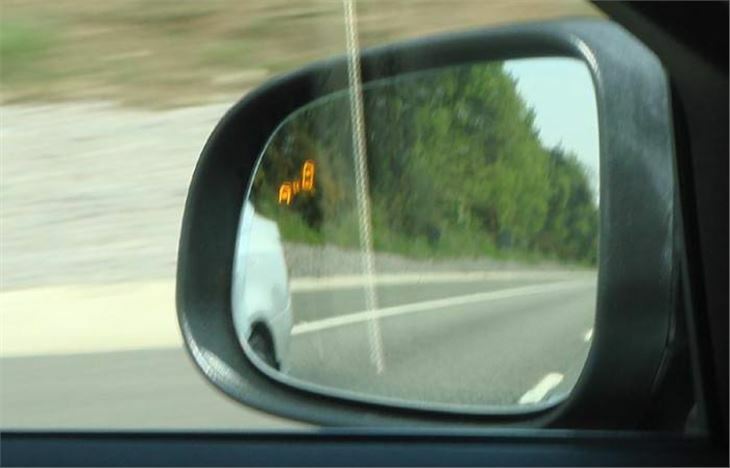 If you see an overtaking opportunity you can take it without having to wait for the box to change down. No heartstopping moments. 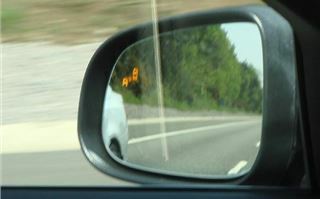 If you are being overtaken, a yellow light flashes in the door mirror to warn you there’s a car in your blindspot. And what an exhaust note. 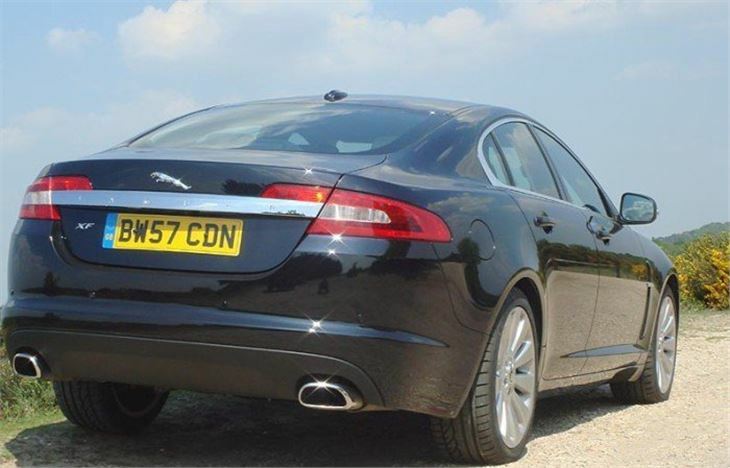 More subdued than the same engine in an XK, but sonorous, mellifluous; an aural joy. The cruise control works better in theory than in practise. The active function is better than Honda’s because once it locks off a car in front, you regain pre-set cruise speed much more quickly. So you can switch from lane 2 to lane 3 without hitting a dead zone and blocking the car coming up behind in lane 3. But the setting system doesn’t always respond, and can’t be relied on like a Mercedes. Say, for example, you’ve been locked on 50 through a roadworks, then accelerate to 70, it won’t always accept a simple flick to re-lock it on 70. But that was the only flaw. 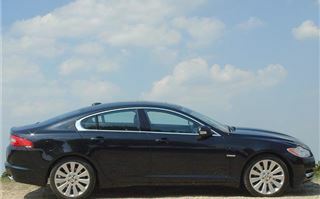 My housekeeper liked the XF more than last month’s Mercedes and almost as much as the FIAT 500 she’s got her eyes on. I got 24.9mpg, which really isn’t bad including a trip into London on a Sunday and just short of the declared 25.3mpg combined. What really hurts, though, is the £440 tax from next year. After 5 years or so, high CO2 in a car like this will see its used value plummet. 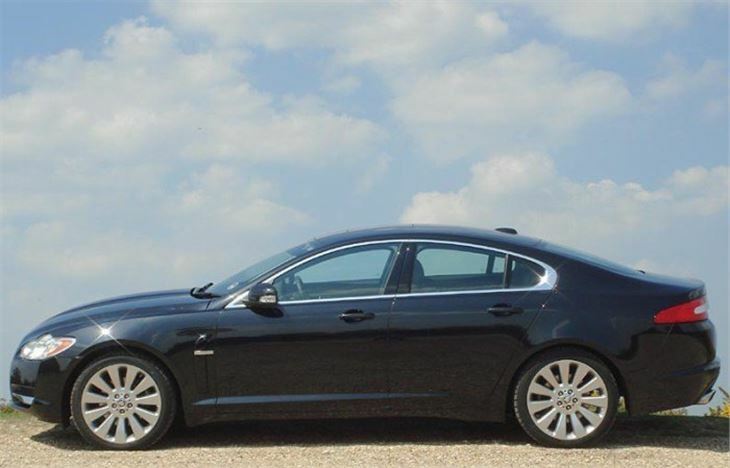 I don’t see the XF as a rival to a BMW 5-Series or a Mercedes E-Class. It makes too much of a statement for that. It’s definitely an English alternative to a CLS.